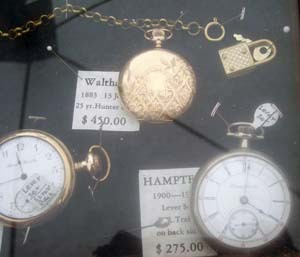 At the Cowboy Festival in Santa Clarita this weekend there were some beautiful antique pocket watches at a place unassumingly named The General Store. 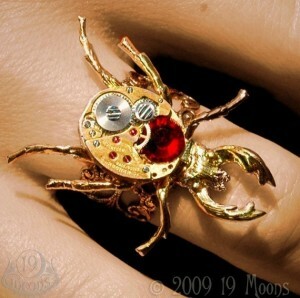 I love pocket watches, especially the hunter-case pocket watches with gorgeous engraving like above. 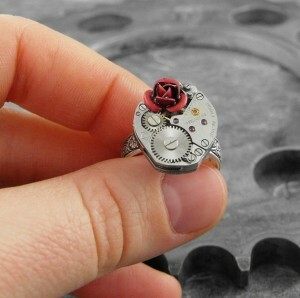 However, I have the terrible compulsion to want to open them up and see their intricate clockwork guts. My grandfather, the dumpster-diving and tinkering one, used to take apart and put back together watches for fun, so maybe it’s in the blood. 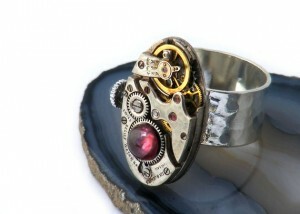 Thankfully, some highly talented artists on Etsy have made some lovely steampunk rings pairing pretty things with watch mechanisms.